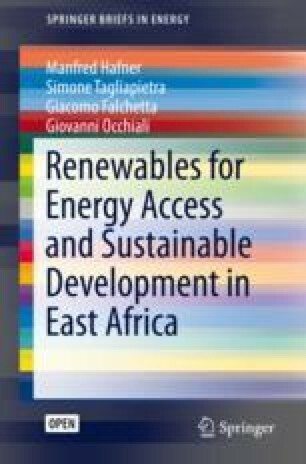 This book has investigated the potential of RE to empower an energy development process in EA, the key challenges to its exploitation, and its relationship with other energy sources. We have touched upon the reasons behind the lagging behind of EA-7 countries in energy development terms, and we have discussed how their technical potential could be effectively turned into installed capacity. At the same time, we have also highlighted a number of technical, economic, cooperation, policy, and financing challenges which must be tackled to achieve such objective. Chapters 2 and 3 highlighted that EA-8 is a region with abundant energy resources, and that these would be technically sufficient to guarantee a self-sufficient development of the regional energy sector, and thus of the overall regional economy. Solar (and in particular PV potential) is the most evenly widespread option and in many areas and it also represents the cheapest solution. Additional generation potential—both as RE (mostly hydropower and geothermal) and fossil (NG and coal)—is abundant but heterogeneously scattered in the eight countries considered. However, irrespective of such large potential, all EA-7 countries are still lagging behind in terms of their energy and economic development potential. The EA-8 regional installed capacity stands at 55 GW, which become only 8 GW when South Africa is disregarded. Among these, most capacity is found in Kenya, Tanzania and Mozambique, although the bulk of power generated in the latter is exported to South Africa. This is rather striking for an overall population of 271 million people (215 without South Africa). Chapter 4 elaborated on the key challenges of least-cost electrification in EA-7, and it found that achieving universal electricity access targets set by the Sustainable Development Goal 7 and satisfying the growth in the demand from already electrified consumers and other sectors would require a mean total investment of about $167 billion between today and 2030. Results also showed that while a coal-based expansion scenario will have slightly lower upfront investment requirements than one based on RE-NG, it will also become the costliest over the long-run. Conversely, RE-NG development will guarantee substantially lower future costs and greenhouse gas emissions. With regards to the different investment components, it resulted that bringing access to electricity to the entire population of the region would require investments in the $60–113 billion range (corresponding to a median of $87 billion, or $5.8 billion/year until 2030) depending on the consumption tier considered and on different projections over shifting cost profiles. When the projections over the growth in the demand for power of already electrified households and an emerging industry sector are also accounted for, a further mean investment of about $80 billion (split roughly equally between power generation and grid infrastructure expansion) is calculated as the requirement to satisfy the demand-side. Putting the mean total of $167 billion in perspective shows that it corresponds to an annual investment of 2.6% of weighted GDP—defined as the weighted average of PPP GDP by the share of international-targeted energy access investment and of exchange rate GDP by the share of local-targeted investment – or to an annual average of $42.5 per-capita during the 15-year period under examination. The mean annual required investment for new electrification stands instead at $37 per person currently without access (also accounting for population growth dynamics), or an annual 1.3% share of today’s weighted GDP. Such disaggregated results help developing a better understanding of the implications and required action from households, private companies, and international organisations. For instance, they reveal that—since 34% of the population of EA-7 is living below the poverty line of around $2/day/person ($730 per year)—a large part of the investment gap stems from the inability to pay of the population currently without access. Cross-subsidies targeted at closing the energy access gap and developing the necessary infrastructure seem therefore a key measure to be implemented from local policymakers. In turn, over the long-run the achievement of universal access to electricity would stimulate the demand in all sectors and boost economic growth of countries, with widespread returns also to those who provided the capital to perform infrastructure investments. Given such conclusions, Chap. 5 then discussed why governmental action is highly needed to create a suitable investment environment to channel such capital, in particular for the domestic private sector and international institutions. Policies in support of RE are only a part of a wider market design that requires rules to govern the interaction of all the economic agents involved in power generation, transmission, distribution and retailing. It was outlined how risks arising from macroeconomic (e.g. exchange and interest rates, or inflation) or political instability, or from weak protection of contract and property rights, as well as from the lack of a stable regulatory framework and due to underdeveloped financial institutions and markets (able to guarantee for the creditworthiness of the off-takers and ensure long and short-term financing availability) represent determinant aspects for energy development to take place. To conclude, Chap. 6 discussed the challenges and opportunities deriving from the recent discovery and development of NG reserves along the coasts of Mozambique and Tanzania. The chapter highlighted challenges and opportunities in the realisation of a regional generation mix based on a RE-NG tandem, and it discussed the factors which might result in pushing the domestic development of each of the two sources. The role of the international LNG price was evidenced as a key decision variable for either the focus on exports or the regional gas market development, and the responsibility of governmental policy was highlighted in achieving an optimal and sustainable power mix. If large-scale grid-connected RE projects are to be implemented, private investment is necessary, and IPPs are pivotal players. These should be incentivised to enter the market with competitive tendering processes following principles of efficiency and cost-effectiveness, rather than having a direct negotiation with government actors. All economically viable, locally available energy sources should be considered, not only for export, but chiefly for domestic consumption and regional distribution (accounting for their external costs, e.g. environmental damage, health-related issues, and climate impacts). Given the particular setting of EA, the focus should be on realizing the potential synergies between RE and NG, with the objective of achieving a least-cost and low-carbon electrification scenario. In all likelihood, RE will cover the greatest fraction of the demand if electrification is to be diffused. NG can serve major urban centres and their industry, foster the development of the transport and manufacturing sectors, and serve non-electric needs in rural areas (e.g. with LPG distribution). This entails the design of energy resources optimisation plans looking into the future, which account for economic, technical, and environmental aspects. The role of the Eastern Africa Power Pool (EAPP) for the energy development of the region should be boosted, and master plans long-sighted: the most effective strategies in terms of infrastructure development, market and contract design, international policy, import/export dynamics, and potential cooperation spill-overs should be identified and rendered operational. Innovative technological solutions such as storage, demand response and micro-grids could play a significant role in the process. Fostering regional interconnections could in fact allow to maximize national energy potentials and integrate more generation capacity into the system, while ensuring its robustness and an efficient management of RE intermittency. More interconnection would also imply the possibility to set the power sector of the region on a significantly lower emissions trajectory than if countries developed their power sector independently. Furthermore, cooperation in transboundary water basin management is of high significance in the context of increasing water scarcity and competition among sectors, in particular considering the issue of hydropower dependency in several EA countries. Political, regulatory, and security risks all represent barriers in achieving private project financing. Enabling institutional and market conditions must therefore be satisfied. This implies, among other things, that access to markets should be improved via roads, telecommunications and institutions so as to increase the economic impact and thus the profitability of electrification investments. The diffusion of digital technologies can play a major role in this sense, as these enable better infrastructure planning and operations, new business models capable of reaching larger shares of the population, easier and smarter payments schemes, cheap monitoring, and big data collection and analysis for informing policy on future planning. According to our electrification scenarios, in the context of EA grid capacity additions and its extension will constitute the largest investment component, with a median value of 58% of total required investments. Nonetheless, those for mini-grid technologies (including PV, wind and hydro-based solutions) represent roughly one-third of total median investments, while those for standalone PV or diesel solutions account for less than 10%. Thus, the grid/mini-grid trade-off should be carefully evaluated in different regions while accounting for an array of conditions, impacts, and uncertainties. Clear rules over potential future interconnections should be set before mini-grid investments are performed, so as to reduce the uncertainty over the long-run prospects of such investment, and thus encourage private participation. Resilience of hard infrastructure over different future scenarios is key. Overall, solar PV is the RE with the largest penetration among mini-grid and standalone solutions, owing to its low cost and massive availability throughout the entire EA-7 region. On the other hand, wind and hydro mini-grids are competitive only in certain circumscribed areas with high potential. Diesel generators are in most cases not cost-competitive with RE to achieve the desired consumption tier targets. Subsidies schemes for connection to the grid or off-grid renewable energy infrastructure installation should be carefully designed and put in place to complement the low ability-to-pay of households and promote their socio-economic development. Communities largely relying on biomass or small diesel gen-sets for their energy needs may be unwilling to invest large proportion of their incomes to achieve RE-based electrification without a predictable return. In particular, the upfront costs for decentralised systems may still be higher than most consumers are willing or able to pay. Subsidies should however be set in the context of well-designed and comprehensive electrification and development plans which look at the specificities of the country, and not be driven by mere political forces. Subsidies are in fact burdensome for public finances, and thus should be spent optimally when in place. The establishment and enhancement of the role of independent energy authorities could be a further positive step in this direction. Renewable energy feed-in-tariffs can incentivise both individuals and companies to invest in infrastructure and have a guaranteed return into the future. In the case of IPPs procuring large power plants, FiTs provide price certainty and long-term contracts that stimulate and help finance renewable energy investments. Being a costly policy instrument, FiTs should be designed so as not to distort the market and to be flexible according to different technologies and changing conditions, and be complemented by tendering processes. For the effective development of off-grid technology to electrify rural areas, the implementation of a set of institutional conditions is highly relevant. Renewable Energy Authorities should be established where absent and have the sufficient discretion and autonomy to regularly update national electrification plans, lobby national governments to provide the means to implement such plans, make sure that private actors are encouraged to invest by offering long-term standardised PPAs and transparent rules (including for future interconnections), and offering connection grants, subsidies and incentives to potential customers. Electricity utilities’ billing schemes should aim at having large flexibility to accommodate as much as possible the needs of credit-constrained households and to nudge them to gain access, so as to trigger a win-win scenario for the provider and for the consumer. Behavioural considerations (e.g. the way information is presented) and the default contract type can play a role in this sense, especially in the emerging context of mobile-based solutions and smart payment schemes. Small energy enterprises should cooperate with state-owned electricity companies to create integrated business-to-business arrangements and so increase access to potential markets and funding. The scale of decentralised energy systems often requires a special and context-specific focus on projects, business models and financial solutions which either of the two institutions could not be able to provide by itself.